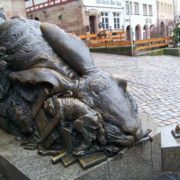 In fact, there are tens of monuments to this charming furry animal in the world. And this post features most famous of them. 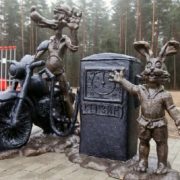 The first one – located in St. Petersburg small monument to escaped from the flood cute hare. Put on one of the piles that protect the St. John bridge against ice, it has become one of the main tourist sights. 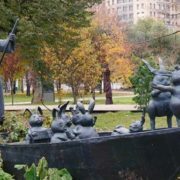 According to legend, during the flood, little bunny jumped into the boot of Tsar Peter and thus escaped. 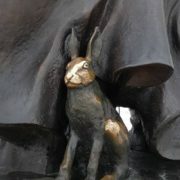 Thanks to this heroic hare, the island on which stands the Peter and Paul Fortress, called Zayachiy (Russian for “hare”). 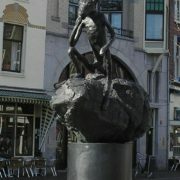 Besides, Arseniy (the name given to animal by locals) fulfills wishes. 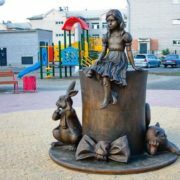 Traditionally, people throw coins onto its wooden pedestal, and if coins remain on it, dream will come true. 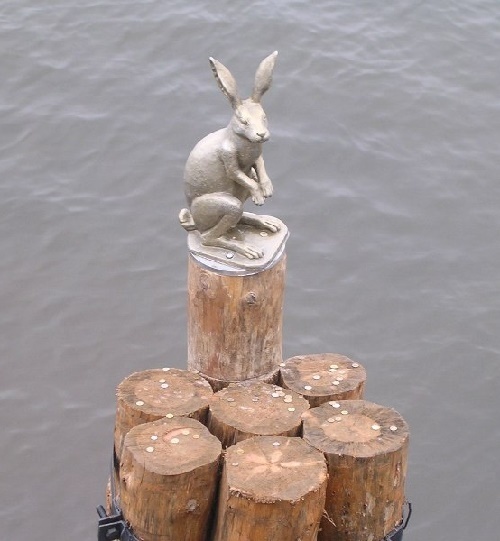 Meanwhile, timbered foundation on which a hare sits, always attracts tourists to compete in accuracy. 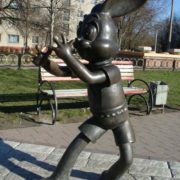 Noteworthy, a small, 58 cm in height, figure of bunny is the creation of sculptor Petrovichev. St. Petersburg authorities opened monument May 7, 2003, at the same time with putting into operation after the restoration the St. John bridge. 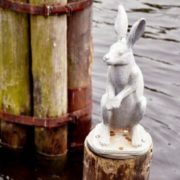 Since then, the bunny and the bridge are inextricably linked and the small sculpture is the mascot of the bridge. 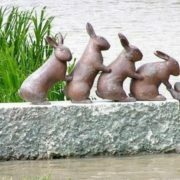 Second, an interesting monument to hare in Japan. 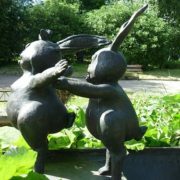 It is Akahada-no Usagi (in Old Japanese “naked Bunny”). 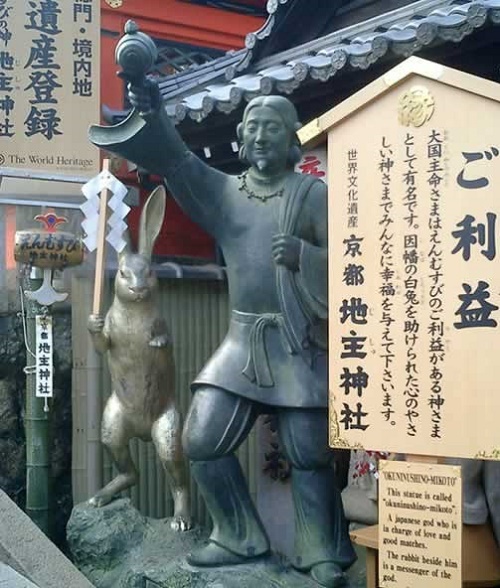 According to Japanese mythology, hare-diviner, the character of the myth of how God O Namudzi (one of the seven names of God O Kuninusi) accompanied by his older brothers – eighty gods who went to Inaba to seek the hands of the virgin Yagami-hime. 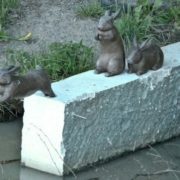 Akahada-no Usagi, having planned to cross the strait, decided to use crocodiles as a living bridge, but when the deception was revealed, crocodiles stripped off his pelt. 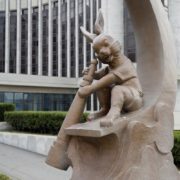 Noteworthy, Akahada-no Usagi in literary monuments of ancient Japan has a different name, particularly, the Syro-Usagi (“skinned hare from Inaba”). 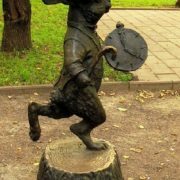 According to legend, in December 1825 Pushkin went to St. Petersburg to support the revolt of the Decembrists. 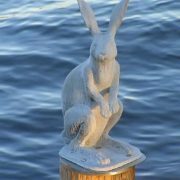 But after the hare ran in front of him, he returned home. 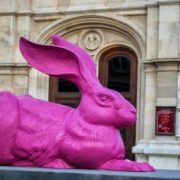 The hare run across the road was a terrible omen, even more than a black cat. 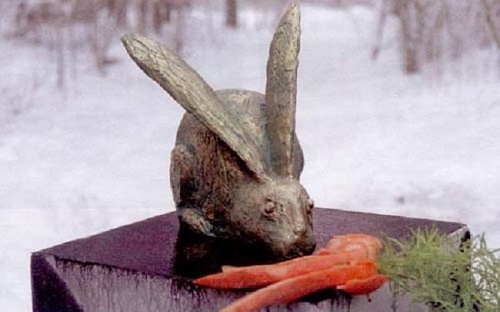 So, the hare saved the life of the famous poet.